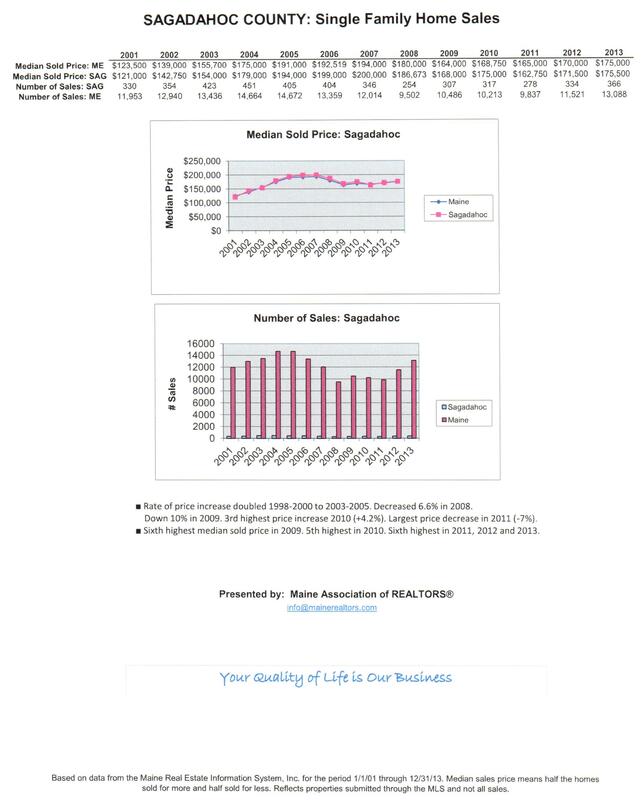 ← Maybe You’ve Noticed . . . .
Often, we get asked, “How’s the market?” The Maine Association of REALTORS® compiles historical data and the graph below tells the story of where we’ve been since 2001 as far as single family home sales in Sagadahoc County. You can see that in 2013, we still had not gained back all of the value that was lost in the aftermath of the 2008 crash and subsequent recession. The climb back has been slow and sometimes, faltering, but it appears that as the State of Maine goes, so goes Sagadahoc County! The Cities and Towns in Sagadahoc County are: Arrowsic, Bath, Bowdoin, Bowdoinham, Georgetown, Phippsburg, Richmond, Topsham, West Bath, and Woolwich. Maine Home Realty can assist with home buying & selling in all of the towns and cities of Sagadahoc County. Call us today! This entry was posted in Market Info and tagged Bath Maine, Maine real estate sales, Market Report, Real Estate sales information, Sagadahoc County Maine, Topsham Maine. Bookmark the permalink.